Polenta. It’s not the most common of ingredients (outside of Italy) but heaven knows why. It’s a great alternative to the usual suspects and works really well with the mushrooms. Give it a go. In a heavy saucepan over high heat, bring water to a boil with salt and pepper. Slowly pour in cornmeal, stirring constantly with a wooden spoon add the tarragon. Reduce heat to low and cook 10 minutes, stirring frequently as the mixture thickens and comes away from the side of the pan. Spoon the polenta into a glass oven dish and spread out using a spatula. Cool completely. Cut the polenta into squares and place under a hot grill for 5 minutes until a thin crust appears then sprinkle with a little parmesan and grill further until the cheese is golden and slightly crisp. In a large frying pan, add 1 tablespoons olive oil cook the sausages over a moderate heat until they are well browned on all sides. Remove from the pan and set aside. In the same pan add 1-2 more tablespoons of oil, depending how much fat came out of the sausages. Fry the onions for 3-4 minutes until slightly soft. Add the garlic and mushrooms and fry for a further 6-7 minutes reducing the heat if necessary. Add the sage, tarragon and tomatoes, tomato paste and 2 cups of water. Turn up the heat slightly and bring to the boil reduce the heat and simmer gently covered for 20 minutes. Add the sausages and cover, cook for 5-10 minutes. If the sauce looks too thin, remove the lid and reduce it down. Stir in the parsley and add salt & pepper to your taste. 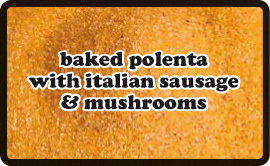 A couple of slices of polenta with the sausage and sauce by its side.